It is not easy to ignore the sound of the creek this time of year. I can hear it when I am walking up our hill and know it to be rushing faster every day with the big thaw here in the northeast. It reminds me of the pace of the world and the needs of this day. The begging of the mighty dollar to be spent on this and that, our children’s future looks more expensive than ever, and will they ever know the stillness of a creek side or the cool waters on their toes? What do our children deserve? A day lined with sports events, college exams, the newest swim suit on the rack, the latest technology, art lessons, ballet lessons, swim lessons, parties and social events that will re shape their future? The better question to ask ourselves is what do our children need? Do they become bored easily, always needing to be out of the house, spending time with a friend, or on an electronic gadget that takes them to another world? Will they grow up thinking that a their wardrode needs updated to fit in, they need the latest phone and a their spring break must exceed the rest or they won’t be cool? And what about their needs? They deserve everything, because we didn’t have the best ourselves? Many times, we do not know what is BEST for us. Even when it is right in front of us. We wouldn’t know. Every day I hear the steady creek, but only when it is rushing do I really take notice of it. It catches my senses and reminds me of the speed at which life will move along with us and the rapid, quick-firing demands that we place on ourselves to give our children everything that (we think) they deserve. And more. We have become a self-gratifying society. With instant gratification and poor planning. We feel guilt over not having our children in the activities or events that we think would be fun, or would make them happy. We stretch our parenthood and our exhaustion to new levels trying to keep up with the latest gadgets. We think we are raising well-rounded kids? We look for things to settle their restless spirits and fill the hours of their day. We want to be good parents. When our children grow up they will remember the fun times, the relentless hours we drove them here and there and gave so sacrificially for them to succeed in life. We are raising well-rounded children. Ambitious, confident, gifted and sometimes nice people. Who think they deserve something. Any thing. Always rushing to try the next thing. Always wishing for more. And always waiting for the next hour to swing by and give them something to do. And here is the deception in this thinking. This is only part truth. We are trying. We are raising politically correct, socially adapt and gifted children that we will usher out into a big world that will tell them they deserve better than this. The habits of busy schedules, necessary interests and a piece of the greater good is rightly theirs. Is this what we are striving for? Have we inadvertently given into the price for peace and chosen a path of success in the eyes of the world, over the very thing that will bring true and everlasting peace? Perhaps you are thinking that this is inbalanced and we can raise children that have the best of both worlds. You are very correct. The problem is that some day they will have to choose one more than the other. And when that day comes, which way will our children lean harder? Parenting is stewardship. Are we giving them everything they need, or are we giving them that which makes our job easier What do they really need? Today, you can choose for them. Some day they will return with what you have given them and more. Leave a Legacy. 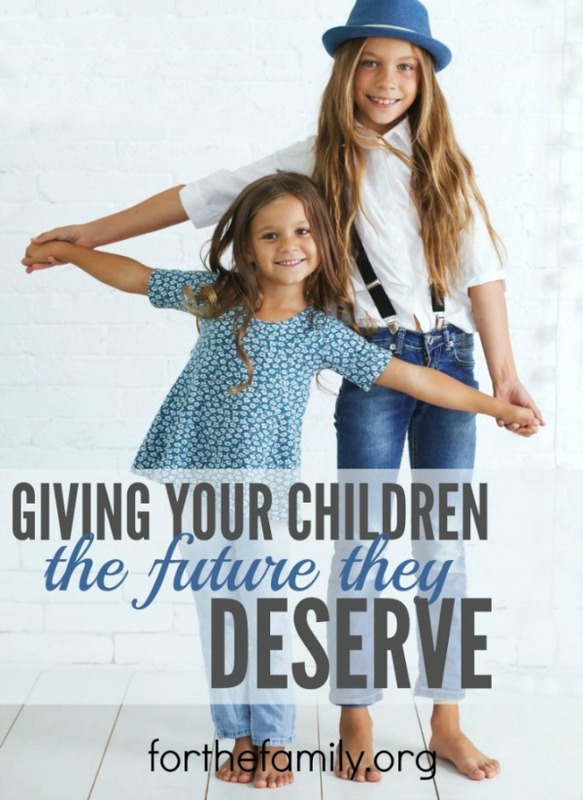 What do you think your children deserve and why? Dan and September have been married for 24 years, and are raising their family with a vision to reach the hearts of their children with a bigger Kingdom purpose than themselves. September has a heart for encouraging women in motherhood. While home educating her 10 children and keeping her home, she has written an e-book to the heart of women, titled Hula Hoop Girl. Her book encourages women to find their identity in Christ, and to not take on more than He has intended. Her journey through loss and tragedy has taught her to be sensitive to the pain in other’s lives. September ministers and mentors with discipleships, speaking, and writing. She writes at One September Day, and is a contributing writer for MODsquad, Allume and Mom Heart. Dan and September are Conference founders for Raising Generations Today, a conference in the northeast, with a strong vision for families. Living the rural life, with barefoot toes, planting seeds, raising chickens, and soaking up the goodness of God’s glory, she finds her favorite place to be is home. Between laundry and life – her heart is to encourage. Connect with September on Facebook and Twitter .